The performance of your joystick could be the crucial difference between triumphing or total oblivion in your gaming or flight simulation experience. As PC’s and gaming devices have advanced in recent years, so has the variety, capability and responsiveness of joysticks increased in tandem. Today joysticks are not exclusively used for PCs and gaming consoles though, they are also regularly being deployed in industrial and academic research situations. 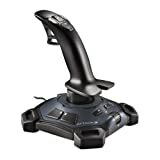 That said though, this detailed expert review considers a set of flight simulation and gaming joysticks and compare them in the search for the best one. 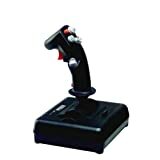 Not every joystick will provide you with a complete set of features and functionality that you need to play games or enjoy flight simulation. However, if a joystick performs well on the following system of four performance pointers, it is well worth spending your money on. A good joystick should be equipped with a host of tactile and intuitive action buttons which can be programmed and customized to suit the demands of different games as well as your playing style. 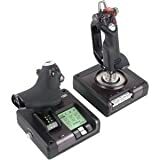 HOTAS is an acronym standing for Hands On Throttle And Stick, the concept of placing controls, switches and action buttons directly on the throttle and joystick in both gaming controls as well as in actual flight controls for flying actual aircraft. 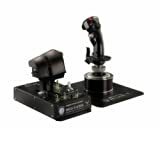 Well designed HOTAS joysticks enable you to control the action on screen, fire your gun as you fly your aircraft or ship without having to take your hands off the main joystick control. With such a joystick, you can train your eyes fixedly on the action taking place on the screen and still retain full control, attacking and taking advantage of the options which come your way. It is a more complete, more immersive way of enjoying game play on both gaming consoles and PC. Force feedback is the vibrating sensation sent back to your hand and fingers in order to give a realistic sensation of the action during gameplay. Force feedback is often included as an option you can either toggle on or off. Some games are virtually impossible to play well without force feedback. As such, even if your current bunch of favorite gaming pursuits do not require force feedback, it still makes sense to opt for a joystick with this feature. You never know when a new sensation will hit the market and such a gaming joystick will turn to a premium asset. As with any piece of electronics or gadgetry, it is important to be assured that your investment will prove real value for money in the long run. A warranty is an important pointer in this regard and the more comprehensive it is, the more highly recommended that particular device is. 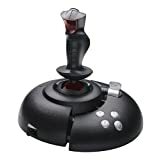 The Extreme 3D Pro Joystick comes with a comprehensive set of 12 action buttons, an intuitive rapid fire trigger as well as an eight way, tactile rubber hat switch. It is pretty easy to customize the buttons to suit different games as well as your playing style. You can also configure the joystick to act as a controller serving different functions as the intensity of the game will dictate. Designed for intuitive control on your PC flight simulator, compatible with FSX, X-Plane, FS 2004 and others! this Logitech joystick provides both ergonomic handling and quick responsiveness of action buttons. 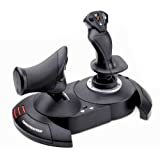 The fact that it is ranked 1th among flight joysticks listed on Amazon.com provides all the assurance you need for the joystick’s functionality and value for money. The Thrustmaster T-Flight HOTAS X Flight joystick comes with one of the most comfortable hand-rests in the industry. What is more, it has a combination of twelve action buttons and five axles, all entirely programmable and customizable to suit the demands of the game and your own style. With its true plug and play design, the device is as easy to install as you would hope for and the device is ready for take off as soon as you have plugged it in and clicked a few prompts on the easy to follow install wizard. -The throttle is not as responsive as you would expect of a top grade joystick. 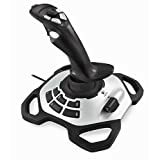 This Thrustmaster T-Flight HOTAS X Flight Stick provides a perfect package for playing your PC games as well as for flight simulation applications. Its true Plug & Play design makes it easy to install and configure it for your favourite games and applications. It provides intuitive and smoothly correlated feedback to the gameplay happening on the screen as well. With its unique Multi-Function Display (MFD) feature, the Saitek X52 Pro Flight System joystick is miles ahead of the competition when it comes to features, adaptability to different playing platforms and the ultimate gaming experience. The joystick comes with two dedicated MFD buttons as well as revolutionary twin set of dials with tactile buttons for even more intuitive in-game functionality. The joystick’s precision centering mechanism and the non-contact technology on both X and Y axis as well as constant spring force all serve to make your gaming experience as realistic a mimic of the real world as possible. -Compared with its predecessor (the Saitek X45) the X52’s dials are much less tactile. This is perhaps owing to the fact that the buttons have been moved in a more restricted but more intuitive central position on the joystick. You might encounter some problems on Windows Vista. The Logitech Flight System G940 Force Feedback joystick is designed to provide flying-simulator-grade sensation to the game player for an unequaled gaming experience. The designers of the joystick have drawn inspiration from both military and commercial flight simulation systems to guarantee an experience that is as realistic as it is fun. While flying, the feedback provided gives you a feel of how the aircraft is reacting to air flow, turbulence and g-forces. Add to this experience the dual throttle system, entirely programmable action buttons, rudder pedals and you will need to pinch yourself to realize that you are not actually piloting a real aircraft. -You need to have the controller plugged in to the PC in order to do such tasks as assigning stick functions or programming profiles. But when you come think of it, this is only a minor convenience and not a showstopper. 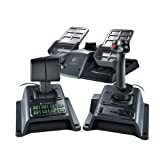 The Logitech Flight System G940 joystick combines a comprehensive set of features and intuitive feedback system to assure you of the most authentic flight simulation and gameplay experience in the industry. It is one of the most versatile joysticks you can spend your money on, combining fully customizable features and easy set up for different applications. A real easy Plug & Play device meant to make those moves and simulations as easy and intuitive as possible. The joystick is preconfigured for Microsoft’s Flight Simulator and Ubisoft’s Blazing Angels and all you need to do is plug in the joystick and you are well on your way to blaze your way through and obliterate all opposition while at it. The controls can also be remapped for other games with a chip inside to store the new settings. Whether you love playing your games on PC or on a Sony Play Station, this is one of the niftiest joysticks you could spend your money on. 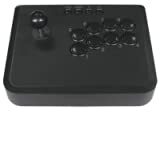 For flight simulation enthusiasts and gamers seeking for a joystick that combines a decent set of features on top of being a real bargain, the CH Products Fighter stick USB will prove a great option. Well suited for use with a host of PC games and applications, the joystick is easy to set up and get going without as much as breaking a sweat. Designed for serious gamers, maybe is better than real aircraft yoke and levers, the full flight system gives you perfect gaming experience you never experienced, all parts sold seperately. Obviously you will spend quite a lot of money on this flight system simulation. We are glad to here any of your opinions, if your favorite joystick was not mentioned in this article, leave a comment or contact us, we can have a bit of discussion. Which is Right for You? Joystick or Yoke?